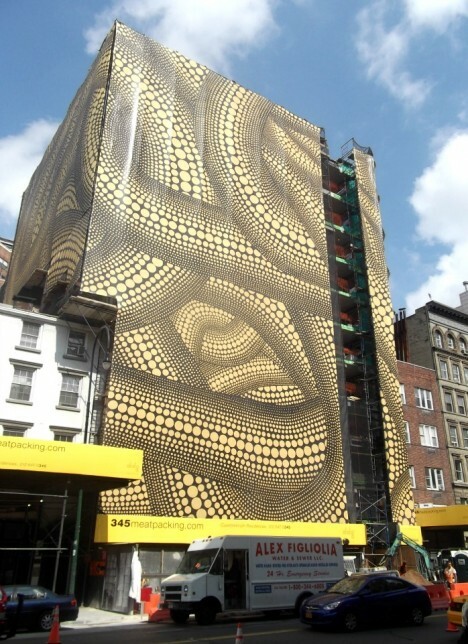 These artistic wraps, scrims and scaffolds creatively conceal the ugly truth of building construction, remediation and restoration. Illusion of justice? 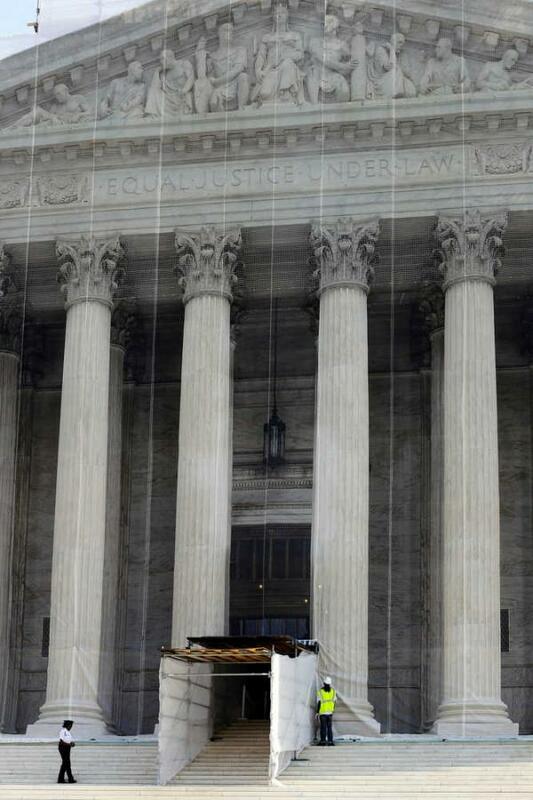 OK, that was too easy but restoring the United States Supreme Court Building was anything but. 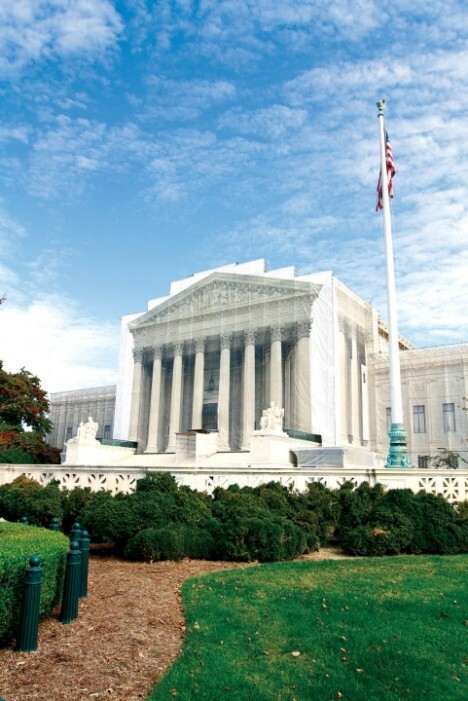 Designed by Cass Gilbert, the building’s classical marble facade has fronted the inner workings of the SCOTUS since 1935. The white Vermont Imperial Danby marble has aged gracefully for the most part but after 75 years of Washington weathering, a comprehensive restoration of the columned West Facade was deemed necessary… and it was going to get messy. What to do? The solution employed by Rockville-based Forrester Construction Co. was a clever combination of inner rigid scaffolding wrapped in a decorative scrim depicting a photo of the facade in its forecasted finished state. 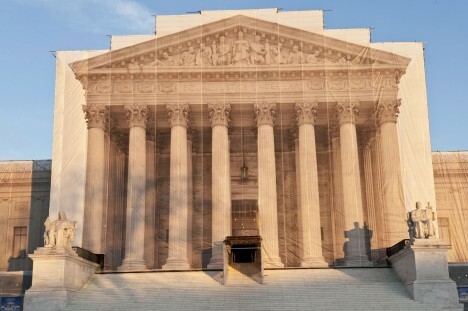 Derived from practices commonly used in Europe, the scrim kept the dirty work of cleaning and restoring the facade under an attractive cover for the better part of two years, being removed upon the project’s completion in late 2013. Sometimes less is more and conversely, more may seem like less. 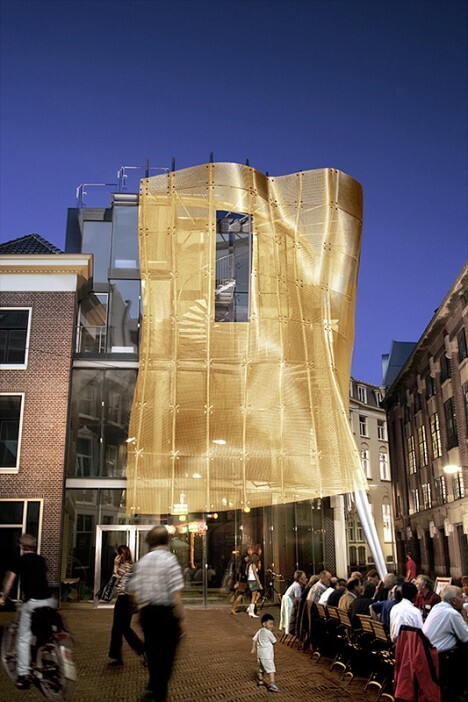 That was the case on Kettingstraat in The Hague, when Dutch architecture office Archipelontwerpers installed a Gehry-esque golden scrim to camouflage restoration and renovation work. 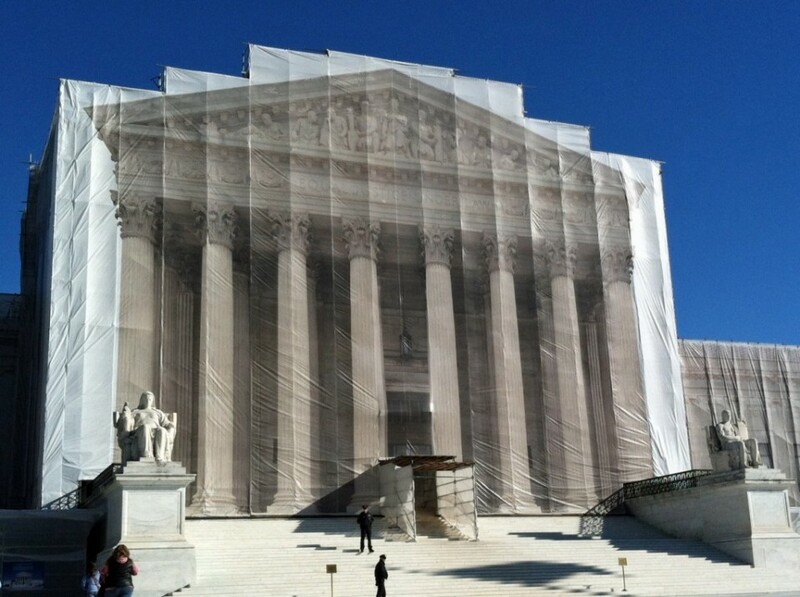 Who’s going to notice the construction with a shimmering curtain of gold to distract their eyes? 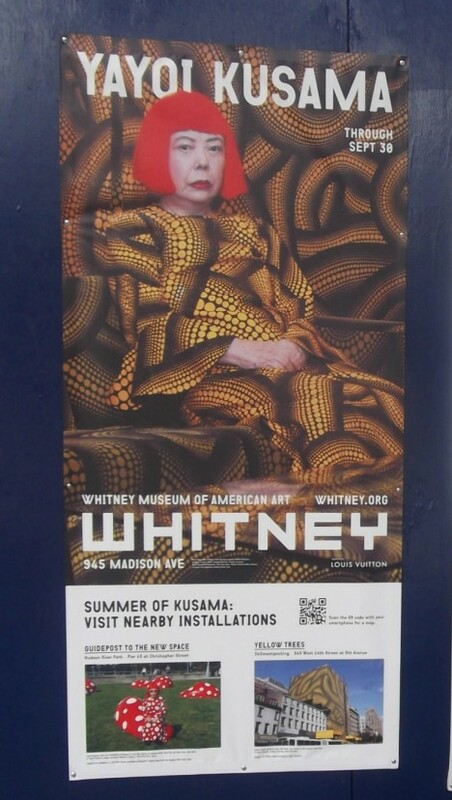 In 2012 when the Whitney Museum of American Art dedicated a retrospective to 83-year-old Japanese artist Yayoi Kusama, they decided to promote it in a big way. 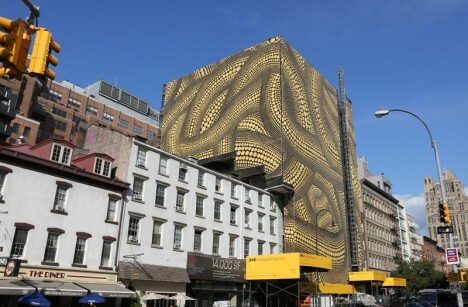 Take “Yellow Trees”, a building-sized art installation doubling as a practical scaffolding scrim on West 14th Street at 9th Avenue, near the Whitney‘s new location in NYC’s trendy Meatpacking District. 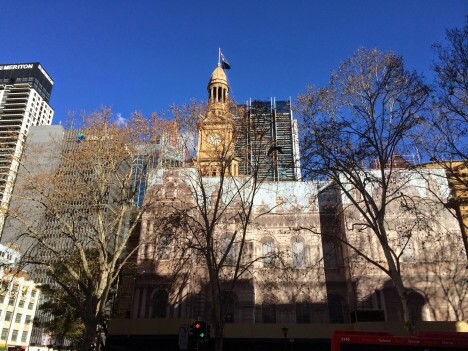 Sydney Town Hall was an Australian showpiece when it opened in 1889 but over a century’s worth of grime can’t be removed in a day or for a dollar. 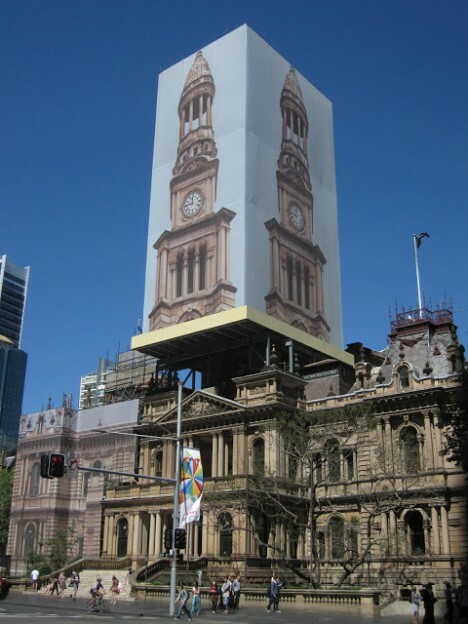 It took $33 million and quite a few days, in fact, and the use of a custom 30m (66ft) tall scrim for the clock tower and 20m (44ft) tall screens for the front facade helped preserve the old gal’s dignity while her cosmetics were being applied.